“From bench to bedside” is an often-heard phrase bandied about in various healthcare disciplines, from drug discovery to translational research and personalized medicine. The underlying meaning, across disciplines, is the same: translating as quickly and safely as possible bench research to point-of-care patient outcomes. The traditional approach to developing pharmaceutical therapies has been to investigate the underlying processes of disease, identify new molecular candidates that interfere with the disease processes, and move these compounds through preclinical testing to clinical development and patients. While this approach has generated many successful drugs, the last decade has seen dwindling pipelines and a drop in the launch of successful new drugs. The scientists who study the complexity that is human biology need new approaches to attack disease and reenergize the drug discovery process. Advances in technology have powered such new approaches, and the last 20 or more years has seen a revolution in our understanding of human biology from a molecular perspective. DNA sequencing technology has enabled scientists to not only sequence the human genome but also to pump out individual genotypes within a relatively short time frame. This capability has enabled genome-wide association studies (GWAS) to associate disease phenotypes with patient genotypes, thus stratifying patient populations with the objective to identify specific genetic variants that are associated with a disease state. Researchers can then identify the functional protein(s) to determine if pharmacological intervention can generate a clinically relevant result and generate highly targeted therapeutic options—a big step toward personalized medicine. Although this approach has started to reverse the flow of information “from the bedside back to the bench,” there are significant limitations that prevent GWAS studies from reaching their potential as a platform for development of new therapeutics: the function of a vast majority of genetic variants are not well understood, limiting the prospects that GWAS data can translate into therapeutics. 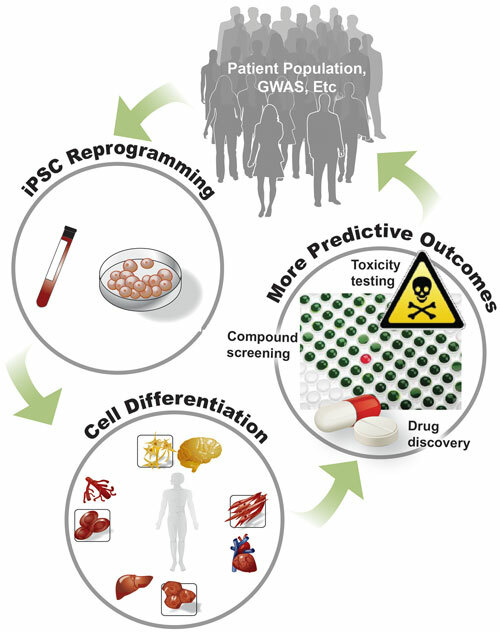 Induced pluripotent stem cell (iPSCs) technology has the potential to link GWAS data to functionality and thus to a therapeutic developmental path. iPSCs are stem cells that are derived from adult human tissue, such as skin or blood. They were first reported in 2007 by James Thomson and Shinya Yamanaka. iPSCs have several advantages compared to embryonic stem cells (ESCs). Like ESCs, iPSCs can differentiate into any cell type in the body. However, because the genotypes and phenotypes of donors are known, they can be utilized in in vitro clinical trials or as cell-based models for human disease. The source of baseline material to make iPSCs, a standard blood draw, is theoretically unlimited whereas ESCs are dependent on surplus embryos from in vitro fertilization laboratories. Importantly, iPSCs are devoid of the ethical, political, and legal complications that burden ESC research. In addition, Thomson’s lab published an episomal reprogramming method in 2009 whereby the underlying genetic code is untouched, overcoming concerns that encumbered viral iPSC reprogramming methods and their safety. Unlimited supplies of human iPSCs and certain types of somatic cells, such as cardiomyocytes, endothelial cells and pan neuron populations, have become available within the last three years due to the industrialization of the reprogramming, cell culture and differentiation protocols. More recently, both peer-reviewed publications and presentations at scientific conferences have presented data that confirm and validate the benefits of employing human iPSC-derived tissue cells in research when questions on human biology are being asked. iPSCs technology has the potential to link GWAS data to functionality and thus to the development of more targeted or personalized therapeutics. For example, Whitemarsh et al., demonstrated that human neurons derived from iPSCs could function as ideal models to test botulinum lot potency determination. Human neurons showed equal or greater sensitivity and a steeper dose-response curve than rat primary spinal neurons, the current standard for botulinum toxin activity. The human iPSC-derived model has the advantage of employing human cells in an assay for developing human therapeutics. It also has the potential to reduce or eliminate the need for animal models. In another recent peer-reviewed publication, Phillips et al., reported human T-lymphocytes isolated from a routine blood draw were reprogrammed into iPSCs then differentiated into retinal progenitor cells. These cells then coalesced into optic vesicle-like structures and then further differentiated into different neuroretinal cell types. Similar results were seen with neuroretinal cells derived from ESCs. The advantages of the model demonstrated in this paper are that (a) both human stem cells and differentiated cells are reliably available, and (b) iPSC technology enables cells to be sourced from patients with diseases, in this case ocular disease. The nature of ESCs does not permit this second advantage. Much of the initial work validating human iPSC technology has been performed by pharmaceutical companies. Pharma have historically used surrogates, such as primary animal cells and immortal cell lines, to represent human biology in cell-based models used for drug discovery. These are imperfect model systems, and the result has been drug candidates that advanced into more expensive preclinical or even clinical development before toxicities emerged. Human cells should provide better models. In a recent publication, Reynolds et al., described using human iPSC-derived cardiomyocytes to evaluate the cardiotoxic effect of an anthracycline-based investigational agent targeting the Her2 signaling pathway associated with breast cancer. While anthracyclines are a mainstay of breast cancer therapy, they are also limited by cardiac toxicity. Combining anthracycline and trastuzumab, the researchers demonstrated that this new drug agent targeted the cancer cells with little or no effect on human cardiomyocytes. The drug has advanced into Phase I testing. This is the first known use of iPSC-derived cells in support of an IND filing. The next step is to conjoin iPSC technology to genome-wide association studies. This is now beginning to happen. The Medical College of Wisconsin, in collaboration with Cellular Dynamics International, were awarded a grant from the National Heart, Lung and Blood Institute to investigate the mechanisms underlying left ventricular hypertrophy. Researchers will generate 250 induced pluripotent stem cell lines from blood samples drawn from Caucasian and African-American families in the Hypertension Genetic Epidemiology Network (HyperGEN), one of the largest GWAS with clinical data available. All of these families have an elevated burden of high blood pressure and are at significant risk for cardiovascular disease. The iPSC lines are being differentiated into ventricular heart cells for use in experiments to better understand the genetic mechanisms underlying this disease. Data from this study is expected in 2016. This study could provide an opportunity to connect gene variants correlated with disease to functional changes in the organ of interest, in this case the heart. “From bench to bedside” was an approach that served healthcare disciplines well in past decades. However, advances in biomolecular and cellular technologies will enable advances that will impact and improve human health. The development of manufacturing processes that provide human iPSCs and somatic cells in the quantity, quality, and purity to become a standard reagent in the study of human biology allow us to study and better understand disease phenotypes and genotypes. iPSCs enable scientists to complete the circle, that is “from bench to bedside and back again,” not only leading to more efficient and innovative drug development but also advancing the field of regenerative medicine and the development of more targeted or personalized therapeutics. Chris Parker (cparker@cellulardynamics.com) is chief commercial officer at Cellular Dynamics International.